The Sunday Salon [9.29.13] – my books. my life. Once again, I had a week with no reading and little blogging. 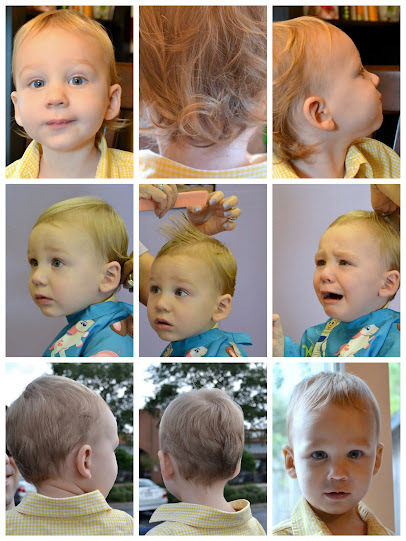 But here are some cute photos of my kid getting his first hair cut. I was a bit emotional before I made the appointment, but I did okay while we were there. Evan cried enough for both of us. And I love the little boy haircut. I loved the curls, but the mullet was starting to become a bit much. If only the top of his hair would grow out, too, I’d let him keep the curls. Oh, yes, I remember the mullet. My son had all these blond curls, but you are right they have to go at some point. He looks like a big boy now. Evan is so cute!! Love the haircut. Nick had tons of curls…and people kept saying we had 3 beautiful little girls, that kind of made Kevin want his hair cut sooner. Really changed the way he looked. My girls didn’t hair hair until closer to 18 months…bald girls!! They had their first haircut at age 5, and they never had bangs….little things a mom remembers. So, only the length was growing? Haha. A mullet. Cutest mullet ever. LOL.